This article is about the minifigure. For other uses, see Darth Vader (disambiguation). 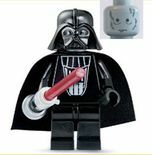 Darth Vader is a Star Wars minifigure introduced in 1999. Since then, the minifigure has been redesigned 13 times, including a chrome-ish black style. 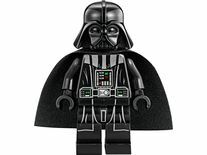 Darth Vader's original variation was his first and most famous variation, which appeared in 11 separate sets, officially representing Darth Vader as a LEGO minifigure, until its redesign in 2008. The minifigure has black legs, black arms, and black hands. His torso has a special design showcasing a control panel with red and blue buttons on his torso, with grey outlines around it. He has a cape, and a classic grey scarred Minifigure head, which represents his battle injuries due to his Battle with Kenobi. Under his head he wears a black cape and over his head he wears an exclusive mask that covers all of his head, representing a breathing mask that keeps him alive. He comes with a red lightsaber. He appears in this variation in the sets 10123 Cloud City, 7200 Final Duel I, 7150 TIE Fighter & Y-Wing, 3340 Star Wars, 78744 Star Wars Value Pack, 10131 TIE Collection, and 7262 TIE Fighter & Y-Wing. He has appeared in all four LEGO Star Wars Video Games in this variation, including: LEGO Star Wars: The Video Game, LEGO Star Wars II: The Original Trilogy, LEGO Star Wars: The Complete Saga, and LEGO Star Wars III: The Clone Wars. He also has a cameo in LEGO Indiana Jones: The Original Adventures in this variation. This variant is almost identical to the original version except the grey on the head and torso outlines is updated to a light bluish grey color. This variant can be found in sets from years 2004-2007. Darth Vader was released in three more sets, 7264 Imperial Inspection, 6211 Imperial Star Destroyer, and 7251 Darth Vader Transformation, with some minor differences from the Original Variation, those being having his eyebrows removed and a few additional scars, to better match his altered appearance in the 2004 edit of Return of the Jedi. In 7251 Darth Vader Transformation he comes with no cape. In the 2008 redesign, Darth Vader comes with the same black hands, black arms, black legs, helmet, and cape as his original variation, except his torso has more details, including his belt and even more detail on his chest panel. The head also, in a strange way despite being in traditional LEGO style, has an increased resemblance to Hayden Christensen. This variation was first released in the set 10188 Death Star, and later re-released in the set 8017 Darth Vader's TIE Fighter, marking it as the new official redesign. The 2010 redesign has the same torso, legs, cape and helmet that the previous redesign used from 2008. The head has a new printing, introducing the pupils for the first time. This current variation is only available with the sets 10212 Imperial Shuttle, 7965 Millennium Falcon, and 10221 UCS Super Star Destroyer. The 2014 redesign has a redesigned torso, with a downwards-pointing shoulderpiece, a more detailed chestpiece and a slightly three-dimensional belt. Vader also has printed legs, depicting his robe and armor. Vader's head is brick yellow, with large yellow eyes, printed cheekbones, wrinkles and scar detailing under Vader's left eye. The 2015 redesign has the same torso, legs and cape as the previous redesign used from 2014. This version uses a larger, two-piece helmet, one piece depicting Vader's breathing apparatus and the other piece the helmet itself. Vader's head is of a white coloration, with no cheekbones, and less scar printing. Vader's eyebrows are larger and are pointed upward, his eyes are of a normal design, and his expression is that of a smile, instead of a frown. Vader's Rebels design has the same head, helmet and legs as the 2015 redesign. Vader's cape is of a softer cloth material. Vader's torso has been redesigned, with a more simplistic design, and his robes cover some of his shoulderpiece. Battle Damaged Darth Vader was a unique variation of Darth Vader, released only in the set 7672 Rogue Shadow, released as part of the Expanded Universe line to promote the Star Wars: The Force Unleashed video game. He includes a grey headpiece displaying a black eye and scars on the left side of his face and a shattered mask on the right side. He wears a black headpiece that goes around his neck, representing his broken mask. He has a grey legpiece, one black legpiece, and a black belt. He also has a black arm piece and one grey arm piece, and two dark black hands. He also holds a red lightsaber. The variation represents Darth Vader's appearance after being fought (and severely damaged) by Galen Marek, his secret apprentice, near the end of the storyline of the video game The Force Unleashed. This variation is available to play after creating a minikit for a certain level on LEGO Star Wars III: The Clone Wars. Alongside LEGO® Star Wars' 10th anniversary, LEGO produced 10,000 Chrome Darth Vader minifigure polybags to promote the event, which were randomly inserted into 2009 LEGO Star Wars sets. The Chrome Vader has the same design as the 2008 version of Vader with the new torso, but shiny paint was used instead of the standard black. This variant has an exclusive variant of Darth Vader's face, which is identical to the 2010 variant, but lacks pupils. This variation is exactly the same as the Original Variation, but only his left arm, left hand, helmet and lightsaber blade can be removed. His hand is attached to his lightsaber. The lightsaber has a built in light, which lights up his lightsaber whenever his head is punched down. He has a built in battery. This minifigure is exclusive to 7263 TIE Fighter. Darth Vader appears as a Microfigure in the LEGO Games set 3866 The Battle of Hoth. Darth Vader (formerly Anakin Skywalker) was once a Jedi Knight and expert pilot trained by Obi-Wan Kenobi. After being taken in Qui-Gon Jinn and Kenobi, Chancellor Palpatine, secretly the Sith Lord Darth Sidious, sensed that Anakin had a great power, and befriended him to gain his trust. Ten years later, Anakin and Obi-Wan were reunited with Padmé Amidala, their old friend and a senator from Naboo, to protect her after an assassination attempt by Jango Fett and Zam Wesell. Anakin began to develop romantic feelings for Padmé, feelings which eventually became mutual. They soon secretly married on Naboo. Sometime later, Padmé revealed she was pregnant, and Anakin began to have nightmares which depicted Padmé dying in child labour, in a similar fashion to the nightmares he experienced before his mother was killed. Chancellor Palpatine eventually learned of this began to tell Anakin a story of a Sith Lord, Darth Plagueis, who allegedly could prevent death. Anakin, immediately thinking of Padmé, became very interested in the story. Later on, Palpatine revealed himself as Darth Sidious, which led Anakin to report him to Jedi Master Windu. Windu and Palpatine became engaged in a duel, which Anakin showed up to after realising that with Palpatine's death, the knowledge of the Dark Side of the Force required to keep Padmé from dying would be lost. Anakin gave into his emotions for Padmé and attacked Windu, saving Palpatine, who finished the former off. After killing Windu, Anakin offered himself to become Palpatine's apprentice, becoming Darth Vader. Palpatine then sent Vader to the Jedi Temple to kill all the Jedi within it. Vader complied and did as he was instructed, and then sent was sent to Mustafar to assassinate the Separatist leaders Nute Gunray and Poggle the Lesser. Obi-Wan eventually figured out that Anakin had murdered the Jedi in the temple and headed to Mustafar with Padmé, in an effort to bring him to his senses. Initially, Vader believed that Padmé had come alone, and told her that he was doing it all to save her. However, after noticing Obi-Wan, he choked Padmé unconscious and initiated a duel with his former Jedi Master. Obi-Wan defeated him, severing Vader's left arm and both legs, leaving him for dead on Mustafar. Vader was severely burned and disfigured by the magma of the volcanic planet. Palpatine, now the Emperor of the first Galactic Empire, sensed the Vader was in danger and rescued him. Palpatine returned with him to Coruscant, where he was given new cybernetic limbs and an armoured suit with a life support system. To remove Padmé from Vader's life, Palpatine told him that Padmé had died as a result of being choked during the duel on Mustafar, which prompted Vader to become enraged and distraught. He destroyed all the medical equipment in the room using the Force. Palpatine, amazed by what Vader had done, realised that Vader was an incredible asset. However, unbeknownst to the both of them, Padmé had actually died of a broken heart after giving birth to Vader's children, Luke Skywalker and Leia Organa. Vader soon became a feared leader of the Galactic Empire, second only to the Emperor. Two decades later, the plans for the Galactic Empire's superweapon, the Death Star, were stolen by Rebels who had infiltrated the Death Star. Suspecting something about the Tantive IV, Darth Vader captured the ship with a Star Destroyer and had Imperial Stormtroopers raid it. After the Stormtroopers neutralised the Rebel troopers on-board, Vader killed Captain Raymus Antilles and captured Princess Leia, who he suspected of being a Rebel. Vader returned to the Death Star with the princess and imprisoned her in the Death Star's detention block. The Princess had stored the plans on R2-D2, an astromech droid. R2-D2 and C-3PO both managed to escape from the Tantive-IV and crash-landed on Tatooine, which led Darth Vader to send troops to Tatooine. They eventually traced the droids to the Jawas and their Sandcrawler, and killed them after learning that they had sold them to Owen Lars. Lars was Vader's step-brother, and unbeknownst to Vader, the man that was caring for his son, Luke Skywalker. Imperial Stormtroopers raided Owen Lars' farm in search for the droids, killing him and his wife. With his family killed and home destroyed, Luke decided to join Ben Kenobi and become a Jedi. Kenobi told Luke about his father, saying that his father was Anakin Skywalker, a great Jedi and amazing pilot, who was supposedly killed by Vader, another one of Kenobi's apprentices. Some time later, the Death Star was infiltrated by Luke Skywalker, Ben Kenobi, Han Solo, Chewbacca, C-3PO and R2-D2. Darth Vader soon sensed Obi-Wan's presence on the space station, and set out to look for him. Vader and Obi-Wan eventually ran into each other, and began to duel. The small band of Rebels managed to rescue the princess, however, Obi-Wan stayed behind and sacrificed himself to allow the others to escape. Vader killed Obi-Wan, turning him into a Force ghost. With Princess Leia free, she managed to retrieve the plans for the Death Star which she had hidden on R2-D2. The Rebels then launched an attack on the Death Star, which Vader personally fought in in his TIE Advanced. Vader killed several Rebel pilots, but was unable to stop Luke from shooting proton bombs into the reactor core of the Death Star. The Death Star was destroyed, but Vader was inadvertently saved by Han Solo when Solo shot Vader's armoured TIE Advanced, which sent him spiraling into space. Between the events of Episode IV: A New Hope and Episode V: The Empire Strikes Back, Vader became aware that Luke Skywalker was his son with Padmé. Vader then became obsessed with finding his son, and after three years, found him hiding on the remote Rebel base on Hoth. Vader launched an attack on the Hoth Rebel base, and after the Imperial Army subdued the Rebels, Vader personally entered the base to search for Luke. However, Luke escaped, bound for Dagobah in search for Jedi Master Yoda. Instead of pursuing Luke, Vader pursued Leia, Han, Chewbacca and C-3PO in the Millennium Falcon into an asteroid field, but turns around after Emperor Palpatine requests to speak to him. Palpatine warns Vader that Luke is a threat to the empire and must be destroyed. However, Vader instead suggests that Luke would be a powerful ally, to which Palpatine agrees. Vader then hired bounty hunters Boba Fett, Dengar, IG-88, and Bossk to find the Millennium Falcon, which was actually hiding on the outside of the Star Destroyer they were on. Vader was later informed by Lando Calrissian that Han Solo and the others were coming to Cloud City on Bespin. The Imperial Navy and Stormtrooper Corps. were stationed in Cloud City, hiding in various places. Lando arranged a trap for the Rebel band to meet with Vader, after which they were captured. Vader ordered for them to be tortured, so that Luke would sense their suffering and come to their rescue, as part of a trap. Vader planned to freeze Luke in a block of carbonite, but after Lando informed him that the carbonite freezer was only intended for cargo, Vader tested it on Han instead. Han survived, frozen in a block of carbonite, and handed him over to Boba Fett. After Luke became aware of his friends' suffering, he stopped training with Master Yoda and left for Bespin against the will of Yoda and Ben Kenobi, who insisted that he was not strong enough to face Vader yet. After freeing his friends, Luke went to face Vader in the carbon freezing chamber. They dueled and Vader eventually managed to push Luke into the carbon freezer, but he escaped before he could be frozen and continued to fight. They eventually came to a narrow catwalk, where Vader managed to cut off Luke's right hand. Forced onto the edge of the catwalk, Luke was trapped by Vader, and told Luke that he was his father. Vader then asked a horrified Luke to join the Dark Side and defeat Emperor Palpatine, but Luke refused and instead chose to fall into the abyss below them. However, Luke survived and was rescued by Lando and Leia in the Millennium Falcon. Vader then began to telepathically communicate with his son, again asking him to join him. Six months later, Vader landed on the secret under-construction Death Star II, and ordered the commander to continue with construction as Emperor Palpatine himself was coming to supervise the final stages of construction. A while later, Emperor Palpatine arrived on the Death Star, and told Vader that only together could they turn Luke to the Dark Side. On Dagobah, Master Yoda died of old age in the presence of Luke, after verifying to him that Vader is indeed his father and that there was another Skywalker. As Luke headed back to his X-wing to leave Dagobah, the spirit of Ben Kenobi presented himself to Luke and told him that Vader was once Anakin Skywalker, and that the other Skywalker was his sister. Luke quickly realised that Princess Leia was his sister, the other Skywalker, which Kenobi confirmed. After joining the Ewok tribe on Endor, Luke informed Leia that she was his sister and Vader was their father. Luke then surrendered to the Imperial Army and was turned over to Vader, where they briefly spoke. They then boarded Vader's shuttle and returned to the Death Star to meet the Emperor. Emperor Palpatine revealed to Luke that he had allowed the Rebels to find out the location of the space station and the shield, and that it was all a trap to crush the rebellion. The Battle of Endor then began, with Luke, Vader, and the Emperor watching from the throne room. Throughout the battle, Palpatine and Vader try to talk Luke into joining them, which fails. However, the Emperor's taunting eventually enrages Luke, and he grabs a lightsaber to kill the "defenseless" Emperor. Vader immediately intervenes, and a long duel ensues in the throne room. Vader continues to ask Luke to join him, and he again refuses, but since Luke's fighting was fuelled by his emotions, Vader managed to sense that Luke had a sister, Leia, who he did not recognise as his daughter. They continued to fight until Luke finally got the upper hand and severed Vader's cybernetic right hand. Noticing the parallels between him and his father, Luke does not kill his father and instead proclaims to the Emperor that he is a Jedi Knight. Enraged, the Emperor begins to slowly electrocute Luke with his Force Lightning. Luke pleas to his father to save him, but Vader simply stands and watches. However, after watching his son be tortured in front of him for too long, Vader realises that his love for his son is greater than his loyalty to the Emperor, and throws the screaming Emperor into the Death Star's reactor shaft. However, Palpatine's Force Lightning damaged Vader's life support system, leaving him injured. Realising that death was inevitable, Vader asked Luke to remove his mask so that he could see him with his own eyes before he died. The two shared an emotional moment, before Vader peacefully died of his old injuries. Luke took Vader's body into his Imperial Shuttle and escaped from the Death Star moments before it was destroyed. Later, Luke cremated his father's body in a funeral pyre as was Jedi custom. During the celebrations across the galaxy on the Galactic Empire's defeat, Master Yoda, Ben Kenobi, and Vader, reformed as Anakin Skywalker once again, appeared to Luke as Force Spirits. In Episode VII: The Force Awakens, Darth Vader was revealed to have a grandson: Kylo Ren, the son of his daughter Leia Organa and Han Solo. 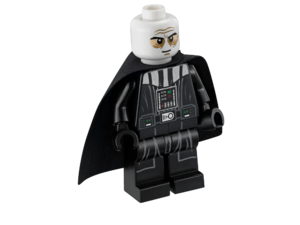 Darth Vader has appeared in a total of seventeen sets, being recognized as one of the most frequently packaged minifigures, but he is below to Luke Skywalker who appears in twenty-eight sets. 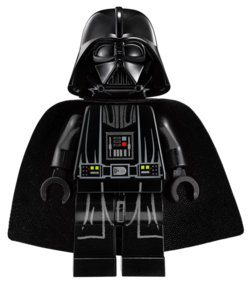 He is considered the representation of the LEGO Star Wars line to a certain extent, after the fact that Darth Vader is the most well known Star Wars character, and has been in the first 6 movies. He was released in the set 8017 Darth Vader's TIE Fighter to symbolize the 10th anniversary of LEGO and Star Wars. His helmet was on the box art of the Episode III: Revenge of the Sith line. He has so far appeared in all of the LEGO Star Wars Video Games. He is the last unlockable character in LEGO Star Wars: The Video Game, that can only be unlocked after finding all the minikits in the game, which makes him one of the hardest characters to unlock. He also has a cameo in LEGO Indiana Jones: The Original Adventures. He is also on the front cover of the book LEGO Star Wars: The Visual Dictionary. In some of the 6211 Imperial Star Destroyer sets, Darth Vader was printed with eyebrows. A red version of Darth Vader's helmet was produced by LEGO for mould testing; however, it was not included in any sets. This colour version is available via Bricklink, giving it the liberty of being considered an official LEGO part. It is the exact same part as Darth Vader's helmet, except it is the colour of red. He appears in two UCS sets, 10212 UCS Imperial Shuttle and 10221 UCS Super Star Destroyer. Darth Vader was featured on the boxes for the 2008 and 2014 sets. From 2005 to 2008, Darth Vader was updated to remove his eyebrows so as to match the 2004 update of Episode VI Return of the Jedi to match Anakin Skywalker's singed eyebrows in Episode III Revenge of the Sith. However, from 2008 onward, the minifigure was given eyebrows again. The 2015 Darth Vader with his helmet removed.